Well, we’ve thankfully made it through another July 4th safe and sound for the most part. Even though school has been let out since about mid-June, I always consider our Summer vacation to start after Independence Day. That’s when the heat and humidity starts to kick in, the pool has been opened long enough to be warm-ish, and vacation plans and road trips are just around the corner. But summer days also mean the beginning of various ailments that try to put a stop to our family fun. Being a parent who at least tries to go the natural and organic route whenever reasonably possible, I have many natural products that are easy to find already at home. So, when common kids’ problems come up, I reach first reach for these natural remedies. In this month’s Kiwi magazine (an excellent read about natural and organic living for families), I read a fabulous article about some natural remedies for common hot weather problems. Let’s talk about four very common summertime problems that parents have to deal with every year as our kids venture out and enjoy themselves. I will be splitting this article up into 4 parts: 1. sunburn, 2. poison ivy rash, 3. various bug bites, and the dreaded road trip buzz kill – 4. car sickness! Beware! Kids sunburn easily, even on cloudy days! Of course, the best advice I can give you is to try to avoid too much prolonged and direct exposure to the sun’s harmful rays. But, who are we kidding, keeping kids from sun exposure is like keeping my brother’s golden retriever from water. Don’t hold your breath. Start with a substantial lathering of a good sunscreen that’s hopefully sweat-proof and protects against the entire spectrum of the sun’s harmful rays. I try to do this religiously, but there are definitely times when I don’t and my daughter ends up getting too much sun in what was supposed to be a short walk on a semi-cloudy day. Or, heck, we all make mistakes…sometimes I just forget the sunscreen altogether! Or, the sun is just too darn strong on some days. Mix everything togeter, excluding the zinc oxide, preferable in a glass jar. Fill a pot with a couple of inches of water and turn on medium heat. Loosely close the jar with the lid and sit it in the water. Stir until melted. Then, add the zinc and stir again very well. Let it cool and use. Reapply often if swimming or sweating a lot. Run a bath that’s just warm enough to be comfortable (you’re going for as cooling as possible, but not too cold). Mix in a cup of apple cider vinegar, which will help cool the burn for a temporary fix. If your child has a sensitive nose, or is just cranky and wants to complain about anything she can think of like the smell of the vinegar, try 10 drops of peppermint oil instead. Note that peppermint can stimulate the senses. For a more floral and calming scent, use 10 drops of lavender oil in place of the peppermint. After a nice, soothing soak, dry them off very gently, and coat them with something cooling like aloe vera (see below). 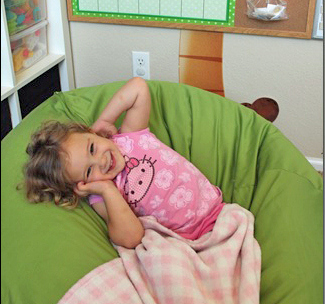 Put on soft, cotton, breathable, loose pjs and let them relax in a big, comfy bean bag chair for the rest of the day. Choose a soft, organic cotton one from Ahhprods.com for a skin-friendly option. Organic cotton bean bags are skin-friendly and soft. While their taking it easy, keep them really hydrated with lots of water. You can also feed them cooling cucumbers and celery, to help lower body temperature. Since your little ones are eating these veggies, I suggest certified organic if you can get it – or better yet, from your own organic garden! If the sunburn is on a certain locations, like the cheeks, forehead, or shoulders (where I usually burn), you can use cool-water-soaked washcloths that have been in the refrigerator for 15 minutes (or soak in ice-water). Place them on the hot spots. Be careful not to make it too cold, as that can damage already compromised skin. If you wring out the washcloth well, you should be ok. You can also place slices of cucumber or potato on the burned areas. If that isn’t convenient, and you have yogurt in the fridge, spread that on the burns. I would caution against this method, though, if the skin is really burned since you don’t want yogurt getting under compromised skin – just a thought. Cucumber wrap cools and soothes. And, lastly, good ol’, tried and true, aloe vera will soothe the burn and often stop the pain quite quickly. I have an aloe vera plant that I grow in a small 7 inch pot in a sunny window. I just water it once a week and really don’t do much to take care of it beyond that. I break of pieces of the spikey aloe “leaves” and squeeze the gel directly on to burns. I think it sort of stinks, but it does wonders for burns! You can of course purchase aloe vera gel, just read the ingredients on the bottle and try to get the least number of non-aloe-vera ingredients as possible to get closest to the real, natural thing. Natural Aloe Vera Plant - see the gel underneath the skin? Yogurt and aloe vera can be messy when slathered on, so after this task is done, steer them back to their bean bag chair – because as long as it’s washable, you won’t have to worry about your other furniture getting sticky and gross. **You need to take your child to a doctor if…there is a high fever (I tend to start worrying about 101 with any illness, but please ask your doctor). If your child seems dehydrated, perhaps complains a lot about a dry mouth, or if the skin looks extremely burned, or worse has blistered, go see the doctor right away. Blisters and broken skin can get infected. Stay tuned for Part 2 – Poison Ivy… Eeks! Have you used these or other homeopathic, natural sunburn relievers? How well did they work? Did your kids like them or fight them? Please share your experiences with everyone!